The Florida man who landed a small copter on the lawn of the United States Capitol on Wednesday is free, pending a hearing next month in Washington, DC. Meanwhile, officials are scratching their heads over new security challenges. 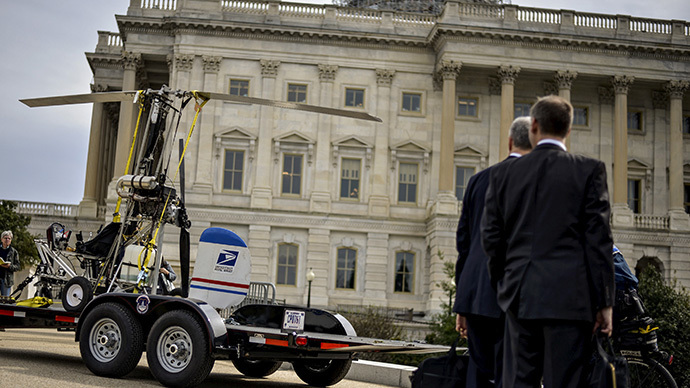 Dough Hughes, 61, surprised officials in DC on Wednesday afternoon when his lightweight gyrocopter touched down on the west lawn of the Capitol. He was apprehended at the scene without incident, and authorities immediately began an investigation how the single-person aircraft had managed to evade seemingly endless security precautions in place across the region. The Tampa Bay Times reported exclusively that Hughes had long been planning to conduct a stunt on the National Mall to protest campaign finance reform, and that the Secret Service had visited him two years previously but decided he did not pose a threat. Now in the wake of Wednesday’s incident, authorities are weighing whether the air space around the capitol is sufficiently protected. “I want to know all the facts before I reach an assessment of what can and should be done about gyrocopters in the future,” Johnson said, according to the Associated Press. According to some in Washington, security could without a doubt be tighter. Rep. Elijah Cummings (D-Maryland), the top-ranking Democrat on the House Oversight and Government Reform Committee, spoke with Secretary Johnson on Thursday and said afterwards that he was not satisfied by Wednesday’s stunt. Hughes was formally charged on Thursday with violating restricted airspace and operating an unregistered aircraft. He’s scheduled to be back in DC for court on May 8, and meanwhile will wear a tracking device while he awaits his next hearing. On Wednesday, Hughes rode his lightweight gyrocopter from Gettysburg, Pennsylvania to Washington, DC with a sack of 535 letters addressed to each member of Congress concerning the Supreme Court's 2010 decision in Citizens United vs. Federal Election Commission. The Tampa Bay Times called the US Capitol Police on Thursday as Hughes was expected to land, and reportedly was told by authorities that they had no knowledge of the pilot’s plans. The Federal Aviation Administration told ABC News that FAA officials had not been in touch with Hughes, and representatives with the military said they were not aware of his plans either. Much of Washington, DC is subject to air restrictions given the proximity of government buildings, including the White House and Capitol. According to the FAA, the only non-governmental flights allowed within flight restricted zone are scheduled commercial flights that go in and out of a nearby airport in Virginia.